The deep color and intense bouquet of vibrant blackberry, vivid boysenberry and wild berry are only a hint at what an extraordinary wine we have created. 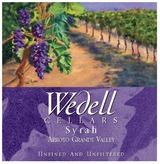 The richness, complexity and full-bodied nature of the Wedell Arroyo Grande Valley Syrah make the wine a perfect accompaniment with many hearty foods. We feel that because this wine is incredibly balanced, it is readily enjoyable now and will mature beautifully for years to come.